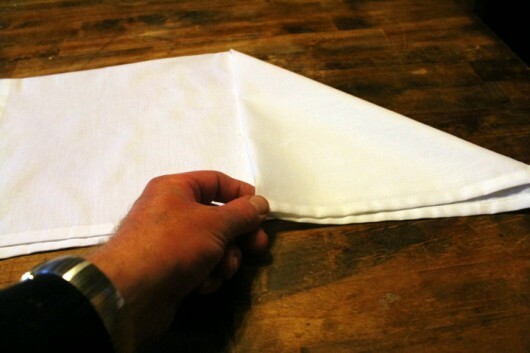 A reasonably-thick cotton or linen napkin will hold this fold without the stiffening amendment of starch. 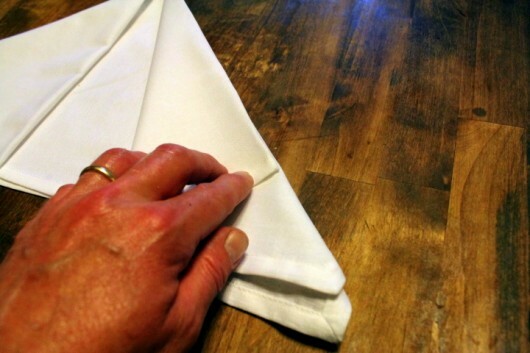 First, fold the napkin in half, with the open end facing you. 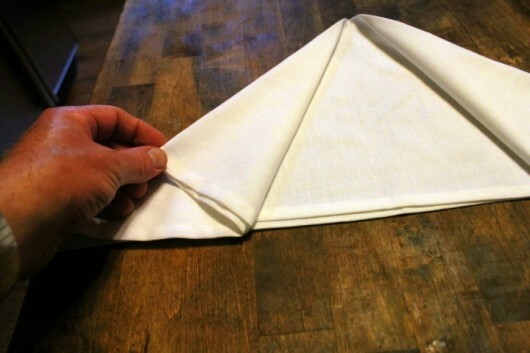 Then grab the top right corner, and fold it down to create a triangle, as shown. Do the same with the top left corner. 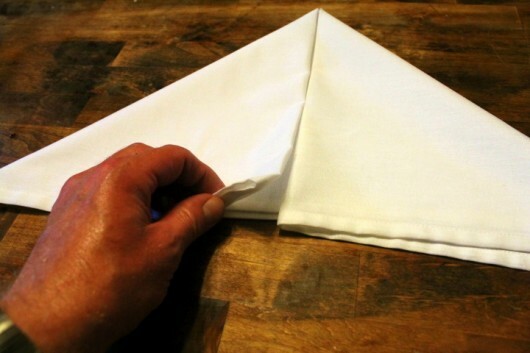 Fold the right triangle in half diagonally, so its outer edge lines up with the far right edge of the napkin. 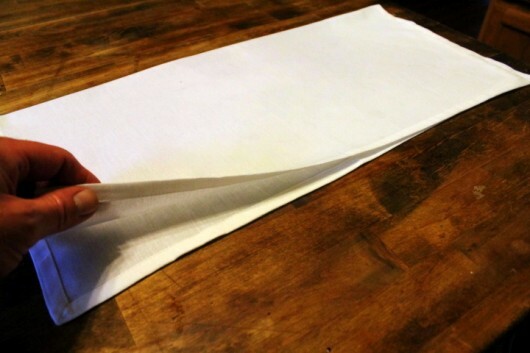 Make the same fold with the left triangle. Et voila — you’ve got an arrow! Point it towards someone you love. Incidentally, you don’t have to wait for a big dinner party to give your table a romantic flourish. 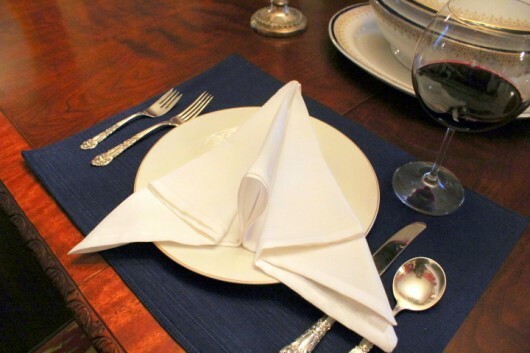 I do these napkin folds even when it’s just me and Will for dinner. Wanna watch me turn other napkins into other shapes? Then by all means leave a comment below. It’s always a pleasure to hear from you. Don’t miss anything from A Garden for the House…sign up for Kevin’s weekly email updates. I really like this one. I’m much more likely to do it too if I don’t have to deal with starching. Hey, I can do that! 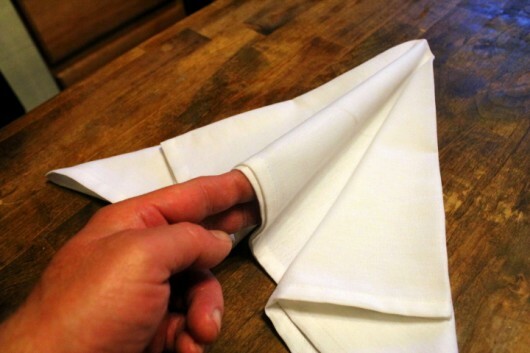 Now we need Napkin folding 103!! 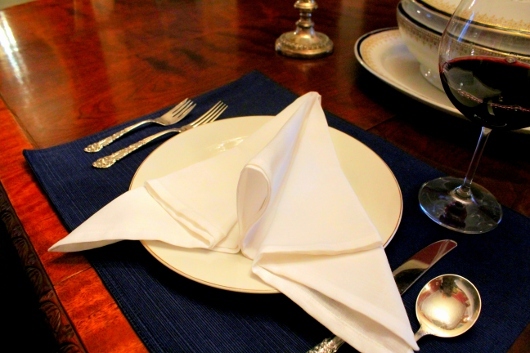 I like this , want more napkin folding. I just made the arrow with a paper napkin. Fancy on a weekday! Please continue. very cool, I like that Jude has already applied it to paper. What a great feature! Our napkins are individualized with each person’s name embroidered diagonally in the corner… Do you have a fancy way to fold that will show the names? Very nice, would like to see more off these tips. Napkins are dinner accessories. You make them special so keep the expert photography and instructions coming. Thank you. Just got off a cruise yesterday. While there, I went to a napkin folding class. Yours is far better! More please! My husband would think this was some sort of airplane …. like a stealth flyer. That’s the first thing I thought of when I saw it but then he talks airplanes a lot so I guess it is ingrained in my brain now too. Either way, it does look nice on a plate. This one is quick and easy enough for everyday! Thanks, Kevin. Love this — please do more! Yes, please show more. I love fancy folded napkins. Yes, more, as many as you will give us. I promise to read and try them. Do I have to beg every time?